Up until the time a child reaches his second birthday, his main interests have been his parents, exploring his world, and practicing new motor skills. These interests continue while he is two and three, but as twos, the children also develop social skills and specific interests. This makes learning centers an especially good method for teaching twos and threes (see the "Setting Up Learning Centers" post from February 25, 2010); your goal as a Bible club teacher is to promote and develop each child's individuality and interests. Intellectual reasoning or "thinking it out in your head" also develops while a child is two years old. An infant trying to get a hard-to-reach object will usually try various physical methods to reach the object, whereas the child over two years of age will very often consider an alternative in her head, and then act. As a Bible club teacher, you can help each child develop the ability to "think through" a problem by using directed conversation. By saying words as the child plays or scribble colors, you can direct her thoughts to consider different behavioral options. This leads the child to think about and talk to you about a way to solve the problem before the child acts. Don't forge to use praise and encouragement as the child thinks through the situation and after she succeeds in solving the problem. After a child's second birthday, he will become increasingly interested in his peers, whereas earlier, his main interest was his parents. However, while young children are interested in other children, they do not always interact with them or find it easy to develop friendships. Children become capable of loving others as they have first received love and as they learn to interact with others. Therefore, children need a positive opportunity to interact with other children in an atmosphere of loving and caring so they can learn how to form friendships, a skill with life-long importance. 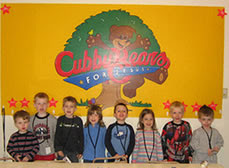 The activities in Honeybees for Jesus and Cubby Bears for Jesus Bible Clubs are designed to help you create such a place, where the growing child can receive a foundation of positive interaction with other children. Not only do preschoolers sing and talk about loving God and each other, but the children are given the chance to talk and interact with each other and with adults who love and care for them.